This is the second post in a four-part series on Kitchener-stitching with a sewing needle. The first part is an introduction and also shows the contrasting color (aka "chimney") method. Today's post presents a system for analyzing the Kitchener stitch, so you can skip the contrasting-color guide, and work the graft with a sewing needle only. Today's method works on stockinette, reverse stockinette, and garter stitch. Today's method also works with ribbing grafted by the double-knitting method, although this may not make much sense until the third post of this series. 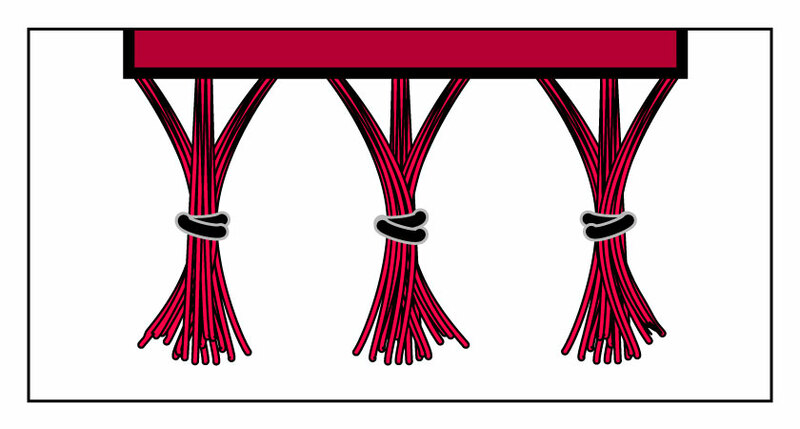 The third post covers two different tricks for grafting ribbing without the half-stitch offset. The fourth and final post covers shaping in last row while Kitchener-stitching, a trick which, among other things, helps sock-knitters get rid of the "donkey ears" at the sides of a toe-graft. TECHknitting blog also hosts a related post about grafting stockinette by using only knitting needles. NOTE: The illustrations are numbered sequentially across the entire series. This post begins with illustration 3: illustrations 1 and 2 are found in the first post. As we saw in the first post of this series, when you unite two fabrics by the contrasting-color ("cc" or "chimney") method, you are actually making a row of knitted fabric with a sewing needle. Odd but true: you’re knitting with a sewing needle. Knitting, as you know, really has only two stitches, the knit and the purl. Because it is possible to duplicate both of these with a sewing needle, this means that many different knitted fabrics can be seamed head-to-head by the Kitchener stitch, and we’ll go to fabric-specific instructions later in this post. Yet, regardless of what fabric we want to graft, there are some techniques common to most Kitchener-stitching, so we’ll look at those, first. For almost all types of Kitchener-stitching, the live loops to be grafted are set up on two needles. The fabrics to be grafted are held back to back. The yarn to be used for grafting is the running yarn of the back piece, cut to a workable length and threaded onto a tapestry needle, the yarn from the front fabric is dropped and not used. 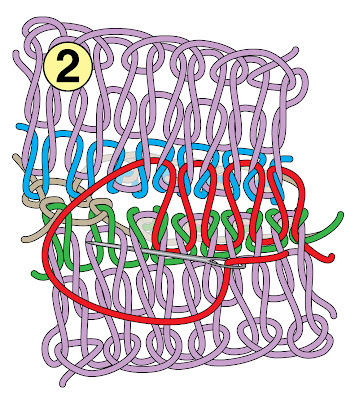 The Kitchener stitch is performed in a four-stitch cycle: per illustration 3, the four stitches are called Front-1 (F1, orange), Front-2 (F2, green), Rear-1 (R1, blue) and Rear-2 (R2, tan). 2) The grafting yarn is passed through the first live loop on the front needle, F1, and F1 is dropped off the front needle. 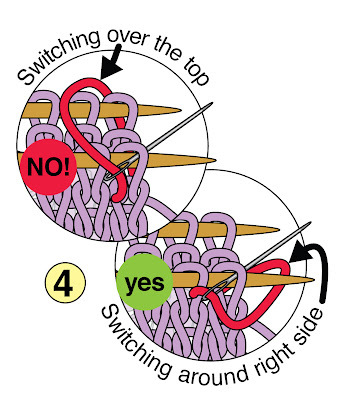 3) The grafting yarn next passes through neighboring front loop, F2, which is retained on the needle. 4) The grafting yarn is then switched to the rear. 5) Next, the grafting yarn passes through the first live loop on the rear needle, R1, which is dropped from the needle. 6) The 4-stitch cycle ends when the grating yarn passes through the neighboring loop, R2, which is retained on the knitting needle. The cycle begins anew when the yarn is again switched forward. In sum, the 6 steps are: switch, pass, pass, switch, pass, pass. We’ll soon get to the details of passing (how and which way) but first, a few trouble spots to nip in the bud. In your set-up, learn to hold the front needle below the rear needle. This gives a clear view of the rear loop to be grafted. Regarding the cycle: every four-stitch cycle starts with a switch forward. If called away during Kitchener stitching, always work through to the nearest R2 so you’ll know where to start again. 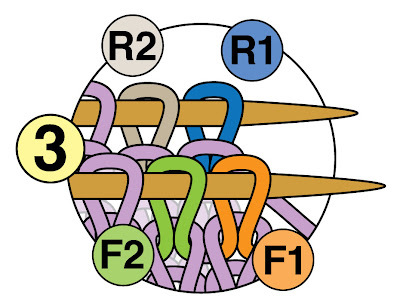 As to sequence: During each cycle, F1 and R1 are dropped from their respective knitting needles. Therefore, when the cycle begins anew, the old F2 will have moved up in the sequence to the F1 position. Similarly, old R2 will have moved up in the sequence to the R1 position. This sequencing rotation has an confusing consequence, as we’ll discuss below. Regarding switching: experience shows that improper switching is the number one cause of Kitchener-stitch failure. Whether switching from front to rear or from rear to front, the grafting yarn is taken around the RIGHT side of the work, in other words, UNDER the knitting needle tips. Do NOT switch over the top of the knitting needles, or you will make a royal mess. Illustration 4. If the threaded sewing needle first passes through a live loop in a PURLWISE direction, and then returns in a second pass through that same live loop in a KNITWISE direction, the new stitch thus created by the grafting yarn will be a KNIT stitch. If the grafting yarn first passes through a live loop in a KNITWISE direction, and then returns in a second pass through that same loop in a PURLWISE directions, the new stitch thus created by the grafting yarn will be a PURL stitch. 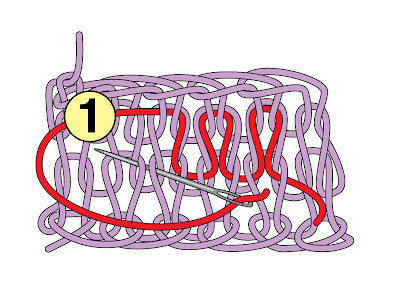 The rule to extract is that to regardless of whether you want to make a knit stitch or a purl stitch, the first pass goes the loop in the OPPOSITE direction to the resulting final stitch desired, and the second pass goes through that same loop in the SAME direction as the resulting final stitch desired. 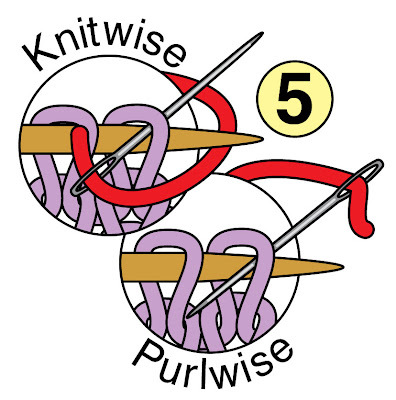 d) insert KNITwise into a PURL stitch. The first pass-opposite/second pass-same rule is simple, but, like many simple things, it gets complicated quickly. The first thing which complicates the simple application of the opposite/same rule is the rotation through the sequence of the live loops in Kitchener-stitching. Back in the note about sequence, we said there was a confusing consequence to the fact that, when every 4-stitch cycle begins anew, the old F2 will be in the F1 position and the old R2 will be in the R1 position. You see, the first stitch, F1, has already received its first pass before it was promoted to its current position. In other words, back when it was in the F2 position, this loop already received a first pass before it was retained on the needle. Now that it has become an F1, it is getting its second pass prior to being slid off the knitting needle. Therefore, when we go to apply the opposite/same rule, we have to remember that even though F1 is the first stitch, it is getting its second pass. Same thing in the rear: although R1 is the first stitch on the rear needle, it is in position to get its second pass. If you remember this, all of Kitchener stitching with a sewing needle gets a whole lot less confusing. 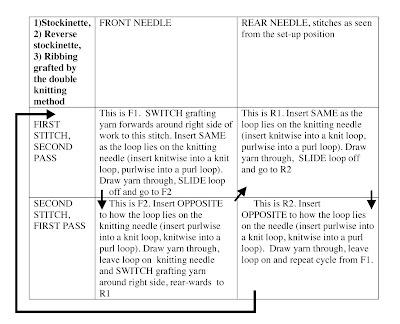 This system for Kitchener stitching is based on applying the first pass-opposite/second pass-same rule. 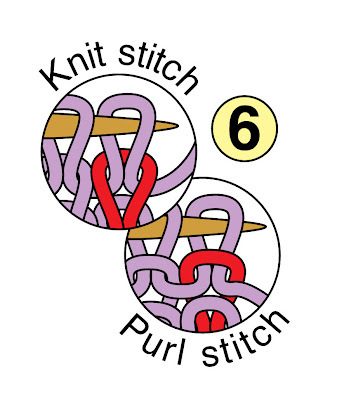 This means we must look at every stitch coming up for grafting and classify it as either a knit or a purl per illustration 6, and then work it same or opposite, as directed. Yet, as the zen masters say, “what has a front, has a back,” and this front/back issue is the second thing complicating the application of the opposite/same rule. In set-up, we hold the fabrics to be grafted back-to-back. If grafting stockinette, the stitches below the loops on the rear needle are going to look like purls, because we are looking at the BACK of the stockinette. So, the question arises: should these stockinette-fabric stitches be classified as knits or purls for application of the first pass-opposite/second pass-same rule? The answer is that for our system, we classify by HOW THE STITCHES LOOK FROM THE SET-UP POSITION. Therefore, the stitches on the rear needle when grafting stockinette are purls, because that’s how they look to your eye which sees the back of the rear fabric. If you sneak a peek back to illustrations 3 and 4, you will see examples: the front fabric is stockinette, and the rear fabric shows as the purls of reverse stockinette. When you come to sort this out in practice, you may find yourself in the middle of a battle between your eye and your brain. See, your brain KNOWS you’re grafting stockinette, so it THINKS it knows those rear stitches are knits, despite the fact that, to your eye, they look like purls from the set-up position. Your brain may scream “you’re grafting stockinette, so that rear stitch is a knit, a knit, I tell you!” Ignore the screaming and trust your eye. Stockinette, reverse stockinette, ribbing grafted by the double knitting method: Stockinette and reverse stockinette look the same right side up and upside down, and from row to row. They are the easiest fabrics to graft. Ribbing will be covered in the next post of this series, but basically, when you graft ribbing by the double-knitting method (to be explained in the next post) it works the same as grafting a stockinette fabric. The rule is: F1, same and drop it off; F2, opposite and keep it on; R1, same and drop it off; R2, opposite and keep it on. Garter stitch: Unlike stockinette, garter stitch fabric changes appearance on the fabric face from row to row, alternating rows of bumps with rows of smooth. Kitchener stitching adds a row, so you must stop knitting when the two garter fabrics to be joined lack the row that would connect them if the knitted item had been knitted all in one piece. In garter stitch, this means that both the front and the rear needles must have the same sort of row showing from the set-up position—either both must have rows of purls below the loops on the needles OR both must have a rows of knits on the loops below the needles. One additional complication: Garter stitch is a backwards application of the opposite/same rule. This is because you don’t want to make the new row you’re adding identical to the stitches in the row above and the row below. Instead, you want to make it opposite, to get the row of bumps in the right place. Therefore, for garter stitch, the rule is first pass same/second pass, opposite. Once properly set up, the rule for garter stitch is: F1, opposite and slide it off; F2, same and keep it on; R1, opposite and slide it off; R2, same and keep it on. 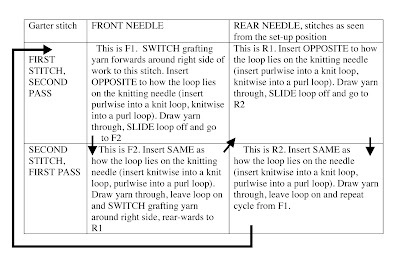 This system states that in each 4-stitch cycle, the first stitch gets the second pass-through of the grafting yarn before it is slipped off the knitting needle. This is clearly true for every cycle of Kitchener stitching except for the very first. As to that first cycle (in all fabrics except ribbing grafted to a bound-off fabric) the first F1 which is pushed off the needle has only ever had one pass—worked as a second pass. Some books seek to correct this problem with special passes done only on the very first F1 and R1. However, experience shows that this really does not make a lot of difference to the finished look. Therefore, just treat the F1 and R1 of the first cycle as if they were ordinary second-pass first stitches. If these charts and all this theory makes you crazy, not to worry, the contrasting color ("chimney") method (shown in the first installment) works really well, is super easy and produces the exact same result. In the next post, we'll take up grafting ribbing--without the 1/2 stitch offset (and no complicated charts, either, I promise). TECHknitting blog has shown how to graft (Kitchener stitch) without a sewing needle. This all-knitting graft is one of the most popular posts on this site. Today, however, TECHknitting blog is starting a retro series--going old-school to look at grafting with a sewing needle. The next four posts (parts of which first appeared as an article in Interweave Knits magazine a couple of years ago) go deep. The second post shows a system for grafting stockinette, reverse stockinette or garter stitch. The third post shows two tricks for grafting ribbing WITHOUT the half-stitch offset--yes it can be done! The graft isn't completely perfect, but these two tricks make grafting ribbing a whole lot better than the offset mess which usually results. The fourth and final post shows how to shape during grafting--for sock knitters, this translates into getting rid of the "donkey ears" at the corners of the toe-graft. The British general, Lord Kitchener, was concerned how his soldiers’ seamed socks maimed their toes. The smooth grafting technique which bears his name solved the problem. Today, Kitchener stitching (also called “weaving” and “grafting”) has risen far above its utilitarian sock-toe origins to become a star technique of mainstream knitting. Yet, like many stars, it has a reputation for being temperamental, difficult, or (in the case of ribbing) impossible. This series of posts present a systematized approach: step-by-step, the Kitchener stitch will be demystified, ribbing and all. Kitchener stitch is a sewn seam where the path of the seaming yarn follows the path a row of knitting would take. Done properly, the two fabrics are literally grafted into one longer fabric—a fabric nearly indistinguishable from one knitted all-at-once. 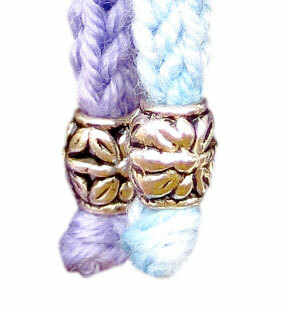 Although it seems magical, its roots are in the humble duplicate stitch. 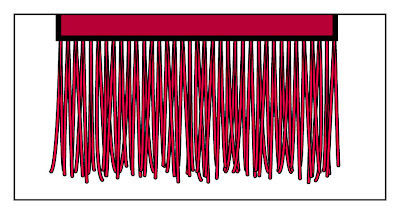 Per illustration 1, in duplicate stitch, a threaded tapestry needle (blunt tip, large eye) is drawn along the face of the fabric. As you see, in order to duplicate each underlying purple stitch, the red yarn must pass twice through each stitch. End each piece of fabric with a cc row. In illustration 2, the bottom piece has a blue cc, the top a green. These cc yarns provide a visual path for the grafting yarn to follow. Bind off each piece. The illustration shows a simple looped bind-off in tan, but any bind off is OK. For ease of handling, you may choose to add a few rows past the cc row before you bind off. Fold the cc rows under, then hold them close, as on the right side of illustration 2. With the threaded tapestry needle (red in illustration) follow the path traced by the TOP of the blue stitches, and the BOTTOM of the green stitches, as shown. When done, pull or snip out your cc yarn (the bind-off yarn will come away, also). 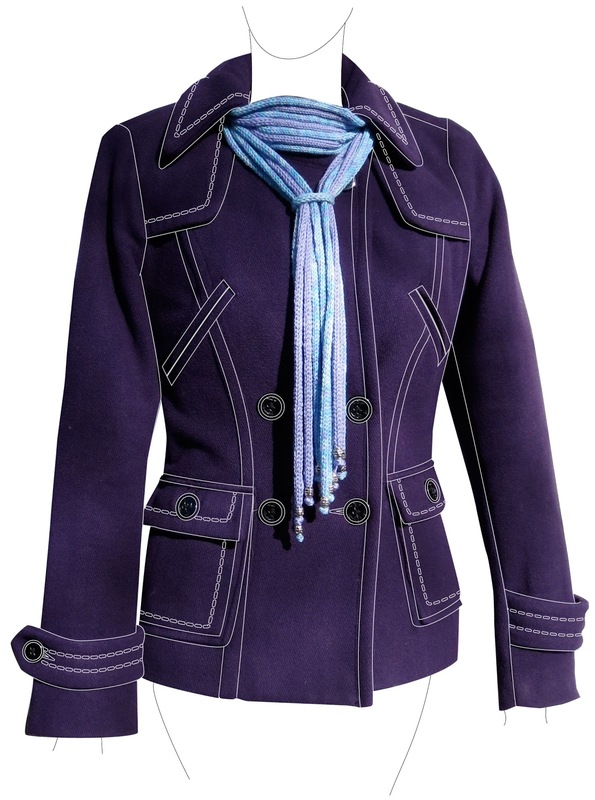 What remains is a single length of fabric, grafted together by the Kitchener stitch. Of course, in real life, you would use a yarn of the same color to do the grafting—the red is only for illustration purposes. Illustration 2 shows stockinette Kitchener stitching, but the cc method works for other fabrics also, such as garter stitch and reverse stockinette. This cc method is sometimes called the "chimney method," and this is because you can work a variant of this trick to graft sock toe. Let's say you are at the end of the sock, and the only stitches on your needles are the ones which are to be grafted together. Arrange matters so that the running yarn comes out of the right side of the back needle. Cut the running yarn to about 10 inches and thread it onto a tapestry needle. Let that yarn hang on the outside of the sock. Now, instead of grafting directly, switch yarns to a contrasting color, and knit a few more rounds on the toe-stitches, going around and around with no decreasing or other shaping. You are knitting a sort of a tube--a contrasting color "chimney." Once you've gotten five or six rounds done, simply pull your needles right out of the work, no need to bind off, even. Next, tuck the chimney rounds down INSIDE the sock toe and hold the two sides tightly together. At the very fold where the sock yarn meets the contrasting color yarn, you will be all set up to contrast-color graft as shown above. In other words, by taking in hand the threaded needle previously prepared, and using it to follow a path along the TOP of the folded-back top cc stitches, and the BOTTOM of the folded-back bottom cc stitches, you'll have a guide for grafting, just as shown above. When the graft is finished, you can unravel and pick out the contrasting color chimney stitches. What remains is a beautifully grafted toe. The cc method is easy to understand and works great. If you like this method, there's no reason to use any other, and you can simply skip the rest of the posts in this series. However, for those who like theory and complication, stay tuned for the next post, which analyzes the Kitchener stitch is all its gory detail, and presents a method which works for grafting stockinette, reverse stockinette and garter stitch, too. PS: Here is a link to a post by the famous knitting teacher Lucy Neatby, which shows a little bit different way to do the chimney method, and has many fine tips for good success. In the previous post, TECHknitting blog featured the Swing Scarf--an easy gift to get ready for the holidays. Today's post is about getting ready for a different holiday, one coming up even sooner--Thanksgiving. Once every couple of years, the urge to post something kitchen-related becomes overwhelming. In the past, this blog has featured no-mess muffins, as well as peach crumble. This bi-annual installment of "tk cooks" offers a quite, quite beautiful (and very easy) addition to the Thanksgiving table: autumn leaf salad. Don't those look like real leaves? The trick is, they're made from colorful sweet peppers. Step 1. Choose the most colorful peppers you can find. *Bonus points for finding two-tone peppers. Step 2. Cook the peppers in a covered bowl in the microwave with a small amount of water, or steam them in a basket over a pot of boiling water. You want the peppers to become soft, but not discolored or mushy, so keep a sharp eye out. 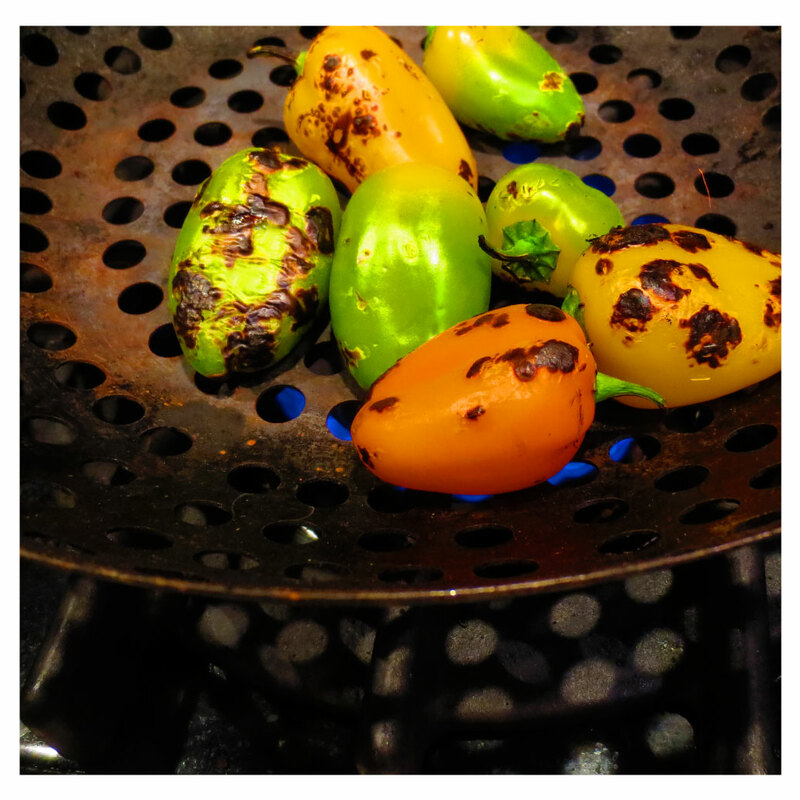 *Bonus points: If you have a gas range or a bar-b-q grill, you can first roast the peppers in a char-broil pan, as shown below. 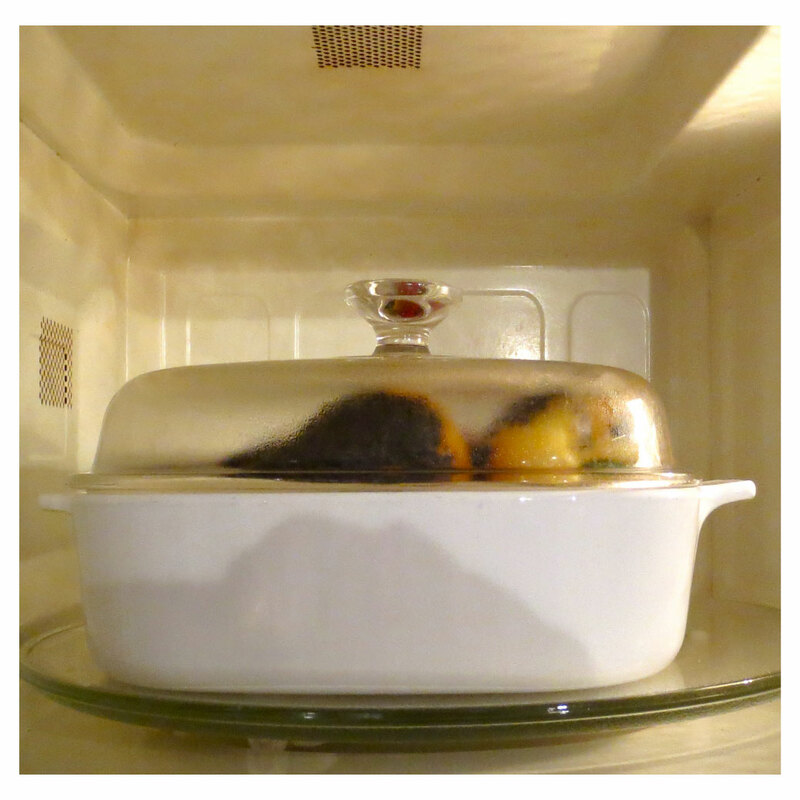 Roast them for only a couple of minutes before microwaving or steaming: roasting improves the taste. (If you have no char-broil pan, you can still roast the peppers: put them directly on the pot-grate over the flame, turning them constantly with a long-handled tongs.) However, again, it is a bonus to roast the peppers: the salad is very good made with steamed, but never-roasted peppers, also. Step 3. Once the peppers have cooled, remove the pepper core through the top of the pepper, then slit one side to create as large a flat sheet as possible. Work in a shallow bowl, saving the "pepper-juice" (pepper-juice = the clear liquid which weeps from the cooked pepper as you cut it). Step 4. With a sharp knife, scrape away any pepper char, and peel away any pepper skin you can get off without tearing the flesh. (Pepper char is the blackened skin, uncharred pepper skin is a clear-ish outer layer which sometimes comes loose in the cooking process.) Char comes off very easily, but skin not so much. However, the more mature the pepper, the easier it is to get the skin off when cooked: red, yellow and orange peppers are the easiest, green peppers the hardest. 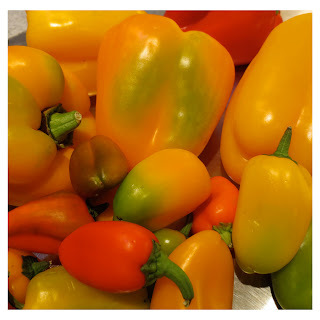 With some varieties of cooked peppers, peeling them with your fingers under running water works very well, and this makes it easy to wash the seeds out, as well. Step 5. Lay the clean, peeled sheet of softened pepper on a plate or cutting board. 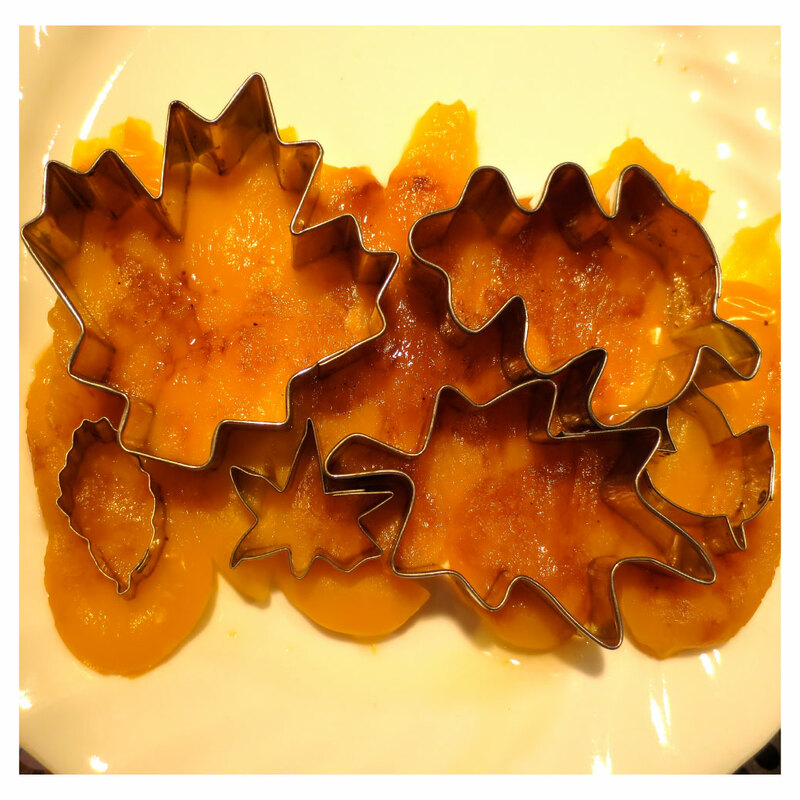 Using leaf-shaped cookie cutters, cut leaf shapes out of the pepper pieces. Half leaves can be used, too, peeking out from under a larger leaf. Sometimes, the cookie cutters don't want to slice all the way through, especially if there is skin left on the pepper. 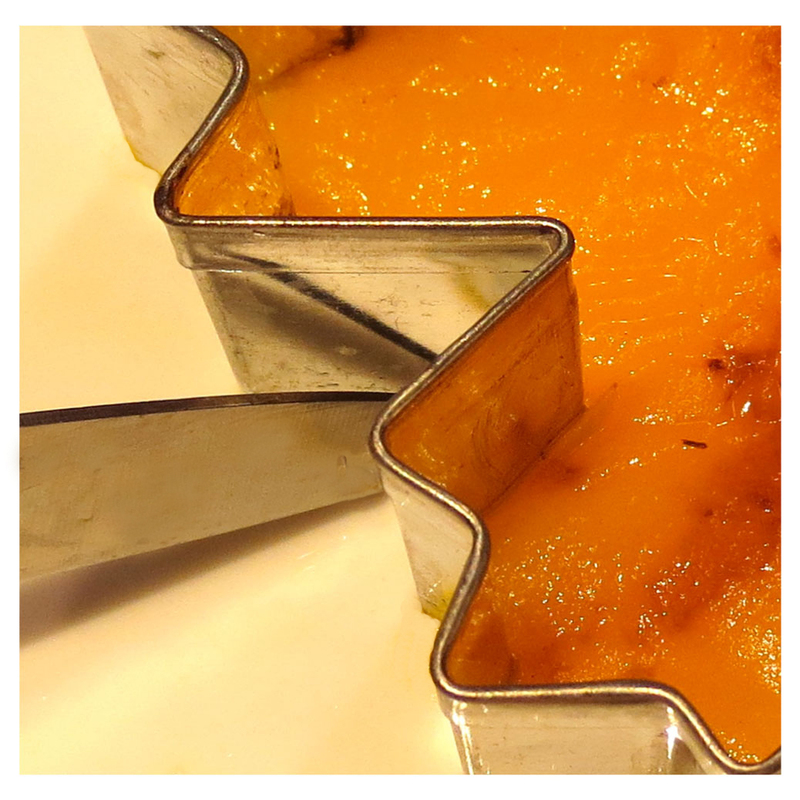 In that case, use a small sharp knife to cut away the stubborn scraps along the outside of the cutter, before removing the leaf from inside the cutter. Step 6. Dice the leftover scraps. Step 7. Use any clear salad dressing you like, or make one up by mixing together a bit of olive oil and all the pepper juice, then add salt to taste. Some like a splash of vinegar, too. Step 8. Toss the diced pepper scraps with some dressing, drain and make a layer of these on the serving plate. 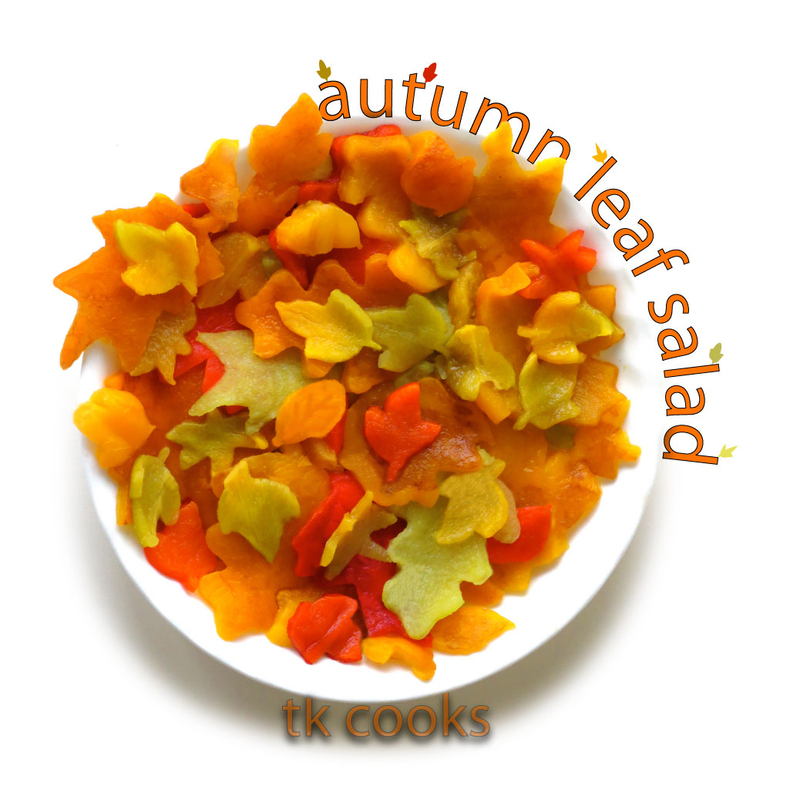 Pull each cut-out leaf through the dressing--you don't want these to tear, so work carefully. Arrange the leaves over the pepper-dice, the larger leaves on the bottom, smaller on top, try to arrange so different colors set one another off. If you need to store this before serving, keep it overnight in the fridge with plastic wrap on top. It tastes best at room temperature, so take it out a couple of hours ahead, but if you forget, just eat it cold--it's pretty good that way, too. Just before serving, re-shine the salad by spooning any pooled dressing back on top, or drizzle or spray a little extra olive oil. Super short cut: Instead of messing around with cooking the peppers, start with bottled roasted peppers from the store. Instead of making this into a stand-alone salad, the pepper cut-outs make an excellent decoration for the top of a green salad or other room-temp vegetable dish. Swingy cords with little weights on the bottom adorn the most ancient garments ever found, and these retain their allure right up the present day. Swing scarves are made entirely out of I-cord, with various weights on the bottom of each cord. The weights make the cords swing when you walk--very pretty. You can knit the I-cords by hand, or with an old-fashioned spool knitter but I recommend using an I-cord mill. With the mill, you can make a whole scarf in a single afternoon--very good for wardrobe additions or last minute holiday gifts. The I-cords are not sewn together, but attached by a new method called "interweaving." Interweaving makes a fine flat seam which does not show on the outside. Interweaving is also very quick. Any sort of sock-weight yarn works well, and Swing Scarves are a great way to use up odds and ends. If you're buying yarn to make these, long-color-repeat yarns, like Crystal Palace mini-mochi, make lovely color-coordinated scarves: each cord features a gradual fade from one color to another, and so brings out the real beauty of these yarns. Another way where Swing Scarves really shine is hand-painted yarns with colors which look SO lovely in the skein, but just don't play nicely together when knit up. Because the I-cord is so thin (4 stitches per row) the colors can't pool and make icky designs. Swing Scarves are a truly good way to use up that hand-painted sock yarn which just can't seem to find a home in other patterns. There are a great variety of little weights you can put at the bottom: beads, buttons, old subway tokens, shells, silver rings, Oriental coins--anything with some holes and a little weight. 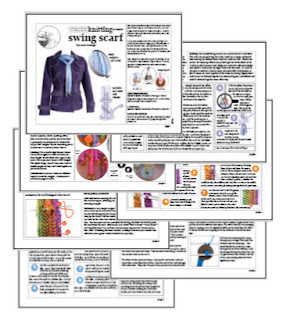 Because of the pretty weights, swing scarves are a little bit like jewelry. You can see more projects made with this pattern on the Swing Scarf Ravelry page. The pattern has 7 pages and costs $3.50. I hope you will have as much fun knitting and wearing these as I have had inventing them and writing the pattern. Thanks to Lynne for the link, thanks to Dutch Hollow Acres for the video! Say you have a scarf or other knitted item with a fringe (tassel-style or continuous-style), and the item needs to be washed. 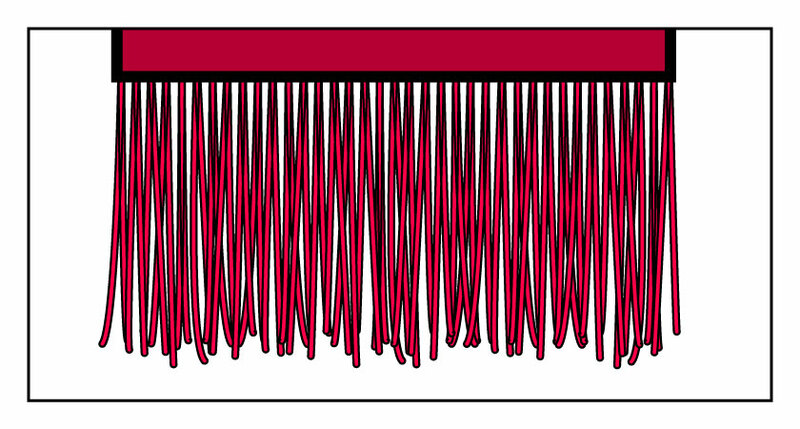 How do you protect the fringe while washing? If the fringe-strands are long enough, protect them from tangling by tying them in one or more loose overhand knot(s). After washing and drying, undo the knot(s). If the fringe is too short to tie in a knot, snap a hair-tie around the fringe. 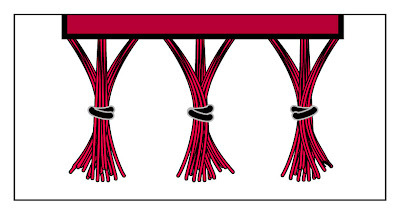 If the item is wide, make several hair-tie bundles, side by side, as shown below. No hair ties handy? Bundle the fringe using scrap yarn, instead. If the fringe is super-long, tie the bundles together in a couple of places along their length. After knotting or bundling, the yarn of the fringe might have a kink where it was tied, especially if it was tied tightly. Lay the fringe on the ironing board and LIGHTLY steam the kinks out. In other words, hold the steaming iron ABOVE the fringes, steaming until they are damp and hot. Pat flat. Do not actually iron the fringe. If working with acrylic, steam very sparingly or the texture of the yarn will change. Here's another alternative: instead of fussing around before washing, just wash and dry however you like. At the end, re-wet the fringe and slap the strands against the side of the tub. Smack the fringe hard enough and the wet strands--whether they make up a tassel-style or continuous-style fringe--will magically untangle. In addition to any of the above alternatives, you might like to consider knotting off the end of each strand with a simple overhand (granny) knot. This prevents the strands from un-plying during washing or drying (or wearing). Knotting ends is a wonderful occupation during a dull lecture, boring meeting or any kind of bus ride. 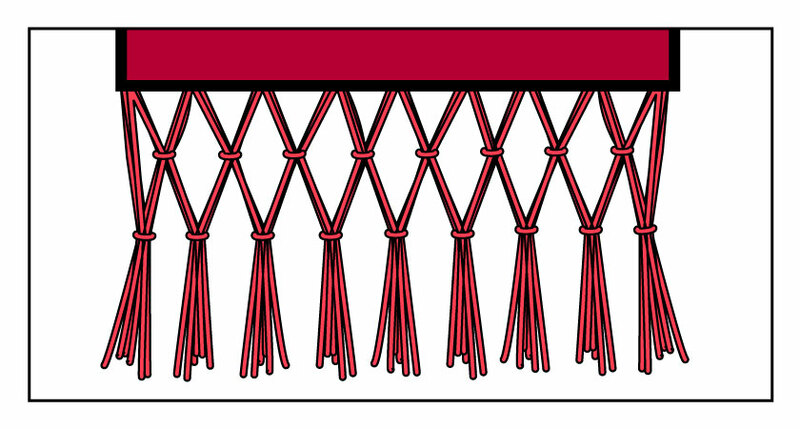 One final option: you can make fringes nearly tangle-proof by tying them off into knotted patterns along their length, as shown below. 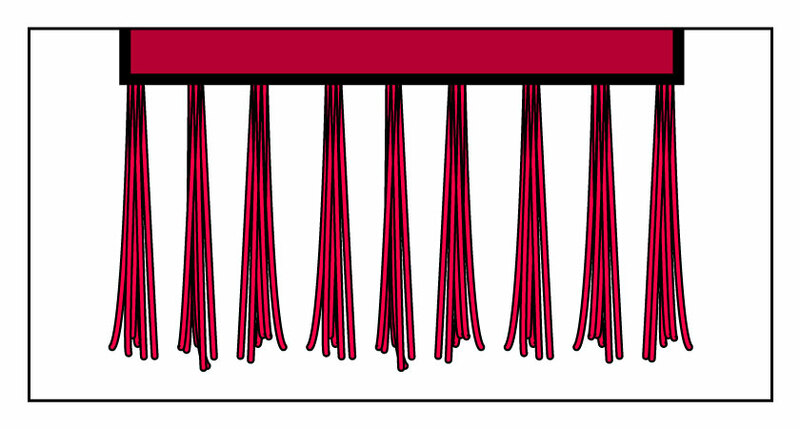 If your fringe is continuous, the first row of tying is used to knot up tassel-style bundles of fringe. 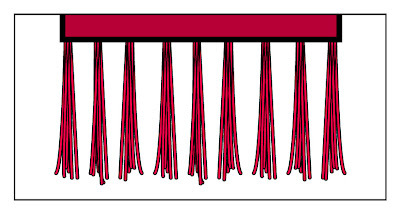 Once the fringe is tassel-ated, the knotted pattern is worked as per the illustration. 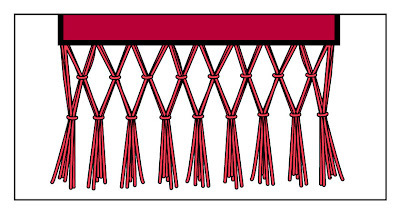 To further research knotting/tying patterns, type the term "macrame fringe" into your browser's search window. You'll get a wide variety of quite lovely fringe options, some an art form in themselves. 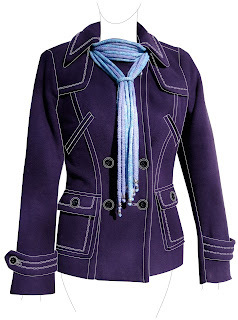 You've been reading TECHknitting blog on "washing a scarf with fringes."